1st Pack Walk: Good and “Right” | All Around Dogs 1st Pack Walk: Good and “Right” | Thoughts on training and life with dogs. Dash and I had our first official pack walk on Friday. This is a significant step forward in our progress because the number of dogs and amount of motion is much higher than his previous class experiences. Unlike the “social” that we participated in with Chad Mackin, these pack walks are entirely on leash. All the dogs participating are working through issues, whereas the social had dogs from stage 1 (stable) to stage 3 (ut oh). So it’s harder in some ways and easier in others. Due to the state of affairs outside (aka “Spring, where are you? ?”) the walks are currently being held indoors. There are cots set up for conditioned relaxation outside the walking area as well as inside a partitioned section in the middle. The majority of the group was directed to enter the walking area one at a time while several of us were set up on the exterior cots so that we could begin with conditioned relaxation. Once again, Dash exceeded my expectations. He did so well on the first cot that when we moved to a cot closer to the action, I let him sit up and watch dogs entering the room and walking area calmly. The hardest part of getting into the walking area was passing by the trainer at the gate – he still wants to greet people NFL-style, even when he’s not adrenalized. Once we got in it was clear he remembered our lessons from the seminar. Aside from one little moment of mutual eyeballing with a shepherd, things went smoothly. It is clearly difficult for him – he walks slowly and eyeballs the side door every time we go by it – but hard work isn’t always comfortable. I cajoled him every so often, speaking happily and picking up my pace, which got a couple of peppy steps and sometimes a small wag from him. One interesting thing I noticed was that he stuck to my left side. Given all the obedience training we’ve done, it isn’t surprising. But he was using my left side as a sort of safety zone. I would switch him to my right side and he’d look uneasy and push or lag until he got back to the left side. Right was clearly wrong for him. We went through something similar with practicing conditioned relaxation on the cot, it became his “home base” and had a hard time moving away from it. His left-side preference is something I’ll keep challenging him on. He needs to know that he can be successful on either side of me. And eventually, that he can be successful without me. 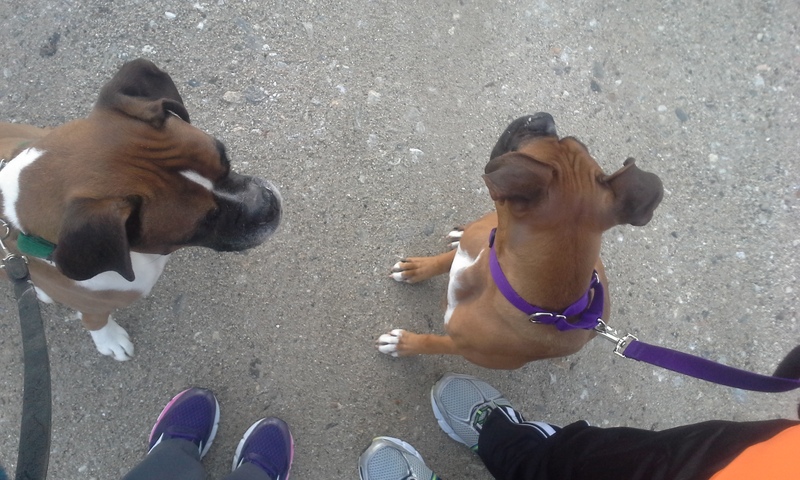 This morning, we decided to brave the brisk weather and take a little pack walk of our own. Dealing with Delta’s energy and a baying hound in the distance was actually harder in some ways, but it was nice for the four of us to get out for some fresh (20 degree!) air. A brr-eautiful day in the neighborhood.